Dive Journal: Our second dive this morning takes us east very close to the Turneffe Island Lodge at a site called Front Porch. We again do a fair amount of midwater drifting, although the lighting has gotten considerably better. 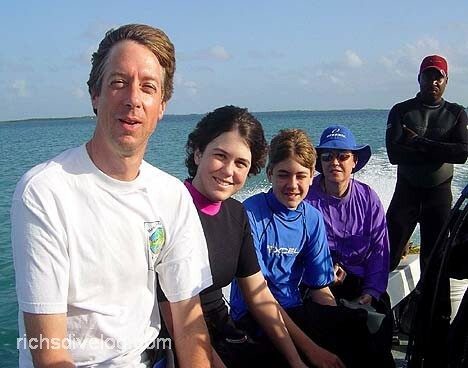 We’re looking for spotted eagle rays and turtles, but none are around this morning here. I find a banded cleaner shrimp down in a yellow tube sponge, and spend a few minutes studying him. When I place my hand close the sponge opening, he scurries up the interior wall and puts 2 long white feelers on my hand, checking me out. I guess I don’t taste very good to him because he doesn’t come out any further. Bo’s brought along an “Aqua Disc” this dive, sort of an underwater frisbee-like thing. We play around with it for a while but it doesn’t really fly too well through the water. Maybe we’re not doing it right, but we can only get it to go maybe 20 feet or so. On exit, Bo locates a very cool looking jelly shrimp-like thing during our safety stop. Looks like a “K” on its back, pulsing and folding in self propulsion. Very cool. Later, I look in the Humann critters book and I think it was some kind of comb jelly.